You are currently browsing the tag archive for the ‘AABC 2014’ tag. Unfortunately my camera was playing up a bit and most of my pictures were blurry. A few did make it through though and a few of wide range of trees that were on display can be seen below. Enjoy. This year I was lucky enough to be invited to demonstrate at the AABC/BCI national convention that was held on the Gold coast. For the demonstration there were a few logistical difficulties on getting stock to work on from Melbourne (1700km away). 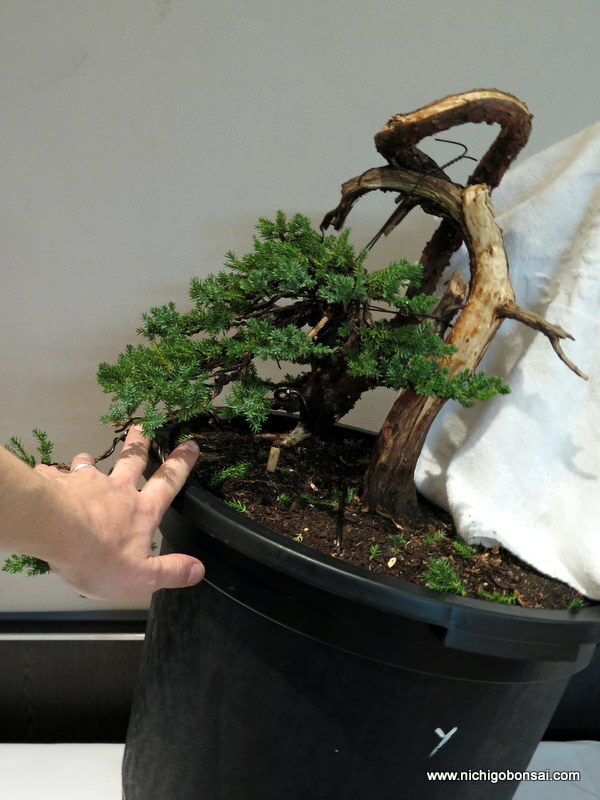 I ended up buying a juniper over the phone from Sydney and then was lucky to have someone drive it up to Queensland for the convention for me. The down side of this was i didn’t really get to inspect the tree prior. I flew up from Melbourne the day of the demo and arrived an hour or two before I had to start. I had requested some ‘interesting’ material and I was surely presented with a unique tree. The mound of juniper pre-work. I spent the hour or so before I needed to be on stage cleaning out obviously dead growth and trying to get my head around the twists and turns of the trunk and where the foliage originated from. 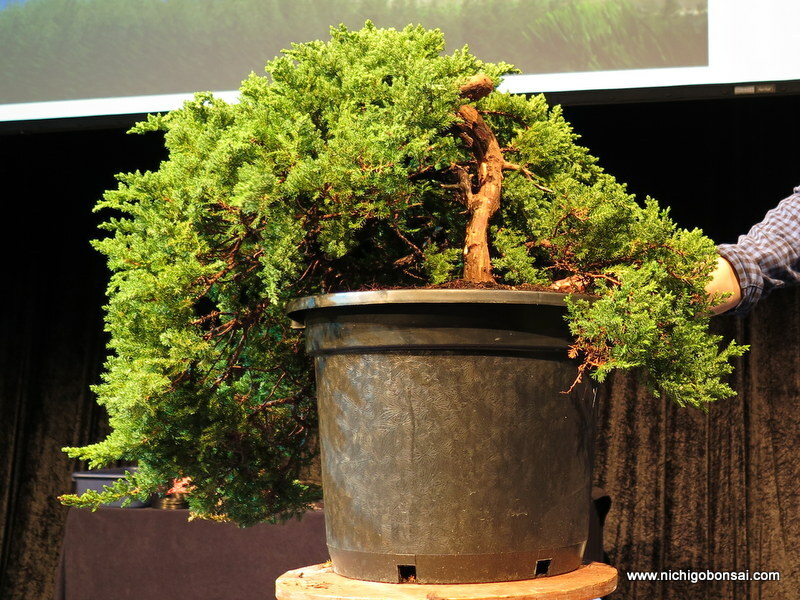 After a busy session on stage next to Tony Bebb from Queensland and Chris Di Nola from Sydney, I managed to wrestle the tree into what I think is an interesting tree along side the other demonstration results. After I had finished I had some time to reflect on the tree for a while and I decided that in hindsight the lower branch was probably not needed. I ended up leaving that decision up to the new owner. (as the tree was auctioned). You may have noticed the towel in the above picture. It is covering a large branch and foliage that is earmarked to be removed in the future. 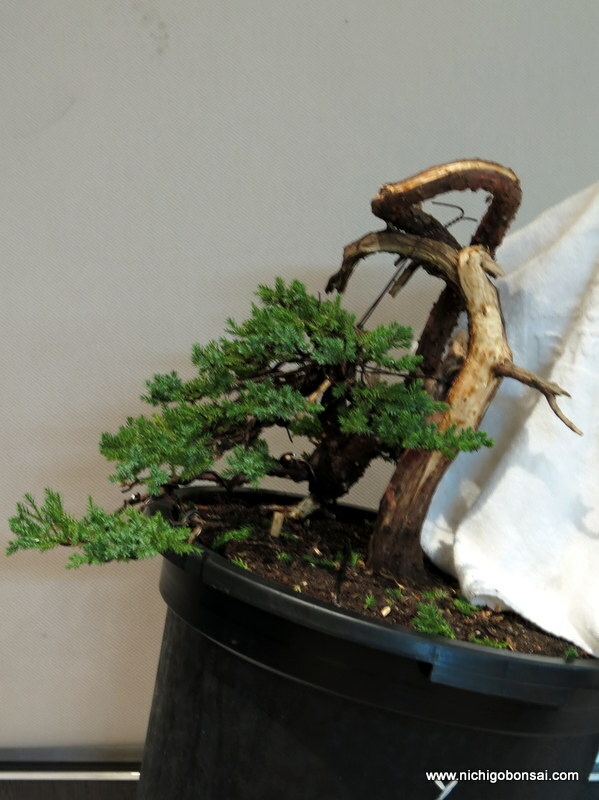 In order to keep the tree growing strongly and able to recover quickly I left that branch on rather than cut it off for an instant bonsai image. At the end of the day the tree would have looked more finished for the demo if id removed the branch but the health of the tree would have been more at risk and the future development would have been more slow. If you leave more foliage on during major styling the tree recovers more quickly, has less chance of reverting to juvenile growth and will generally save you a lot of time in the trees journey from stock to show tree as the tree doesn’t go into a slowed down state while it recovers. A small sacrifice now leads to big gains down the track and being auctioned I didn’t want someone to go home with a dead tree.